Anyone familiar with the Ferree family history knows the story of Joel Ferree, the son of Philip and Leah Dubois Ferree. Joel Ferree (1730-1801) was a prominent gunsmith and patriot and believed to be the first known of the family to actually practice gunsmithing. During the Revolutionary War he was requested by the Committee of Safety to manufacture rifles for use by the militia. In 1785 Joel Ferree acquired a land patent of about 300 acres on Peters Creek, Jefferson Township, Washington County, Pennsylvania. 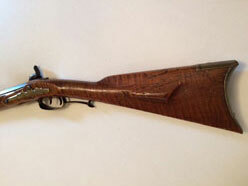 Karen Laufer is the proud owner of one of the few Ferree rifles still in existence. She inherited the rifle from her father and below is her story of her family and the rifle. My father, the late Thomas L. Williams grew up in West Elizabeth, PA - a small town about twenty miles south of Pittsburgh along the Monongahela River. His family before that had lived in areas along Peters Creek - near where the Ferrees had their gunsmith shop and powder factory in Large, PA. We don't know who had the rifle before my Dad's maternal grandfather, Benjamin Franklin Bowen (a great name) had it. 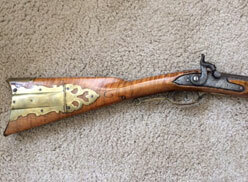 He was in the Civil War, but that was in the PA Ringgold Cavalry, so would not have carried a rifle like this with him as they used carbines and pistols. My grandmother, Violet Bowen Williams, inherited the rifle from her father, Benjamin. She then gave it to my Dad way before she passed away in 1965. Dad always kept it under the bed in the guest room until someone came to stay overnight, when he'd move it. My Dad and Mom moved from Elizabeth, PA in 1942 when my Dad enlisted in the Navy as a photographer during WWII. He ended up at Norfolk Naval Base and eventually Camp Perry near Williamsburg, VA.
Dad and Mom fell in love with Williamsburg where the restoration was still ongoing. Colonial Williamsburg did not have a photographer and would borrow my Dad from the Navy to document important visitors to CW. Upon his discharge in 1946, Colonial Williamsburg offered him a job as their first photographer. He accepted and he and my Mom lived the rest of their lives there until their passing in 1988 and 1999. I enjoyed growing up in Williamsburg. 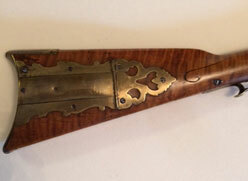 The expert Master Gunsmith and other gunsmiths at Colonial Williamsburg have extensively studied this rifle and authenicated it as a Ferree rifle, despite the fact that it is unsigned. They said many of theirs were unsigned. 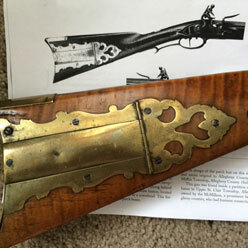 The Master Gunsmith dates the rifle to 1784-1788, no later. 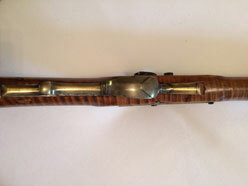 It was converted from a flintlock to a caplock at some point - not unusual. Also, someone shortened the barrel by 4 inches perhaps because they were a short person. 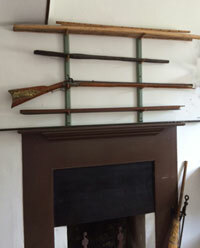 It was hung over the fireplace in the gunsmith shop at Colonial Williamsburg. This is a photo of the rifle beside a copy of an article given to me by the gunsmith at Colonial Williamsburg showing a signed Ferree rifle with an identical patch to mine. There is some original wax in the patch box and some patches which the gunsmith said are original to the gun. Source: Our sincere thank you and appreciation to Karen Williams Laufer, owner of the rifle, who shared her story of the rifle and the photos.